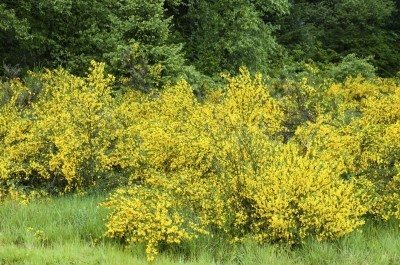 Scotch broom (Cystisus scoparius) is an attractive shrub that rises to about 10 feet high with an open, airy growth pattern. Despite the beauty of its bright yellow spring flowers, it can easily look disheveled if not pruned correctly. Pruning a scotch broom shrub must be done conservatively and at the correct season. 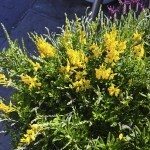 Read on for information about scotch broom maintenance. 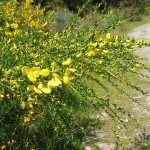 Scotch broom plants may require pruning because of broken or diseased branches, like any other shrubs. More often, however, gardeners decide to prune a scotch broom plant because it has outgrown its allotted space or grown scraggly as it matures. However, once the plant is fully grown, it may be too late to reshape it by trimming and can even get out of hand, requiring control. Scotch broom maintenance must begin while the shrub is young. The first rule for pruning a scotch broom shrub involves timing. Although broken or diseased branches can be pruned off at any time of the year, size or shape pruning should only be undertaken in late spring, immediately after flowering. This rule about pruning a scotch brook shrub in springtime is critical if you want an attractive bush. The scotch broom sets its buds for the following year just after spring flowering. If you snip in autumn or winter, you will dramatically reduce the amount of flowers your plant produces next summer. What Age to Prune a Scotch Broom Plant? It is also important to begin trimming when the tree is young. Begin your scotch broom pruning before the tree is mature, and prune back its stems annually. This stimulates growth to prevent that scraggly look. But when you prune a scotch broom plant, be conservative about how much to trim. Only trim back a little to shape the tree. Never cut off more than one-quarter of the foliage in any one year. If you need to do more scotch broom pruning than this, spread the clipping over a number of years. Once the tree has grown large, it is too late to repair its scraggly look. According to experts, the mature branches do not retain many green buds. If you cut these branches back severely, you are not likely to get a fuller plant; in fact, if you prune a scotch broom shrub in this manner, you may kill it.